The fetching Mrs. B and I will be attending a special concert in Houston's Jones Hall this Saturday night, as our Maestro Andres Orozco-Estrada leads our world class Houston Symphony Orchestra in an all Beethoven program: Symphony #6 "Pastoral", and Symphony #7. 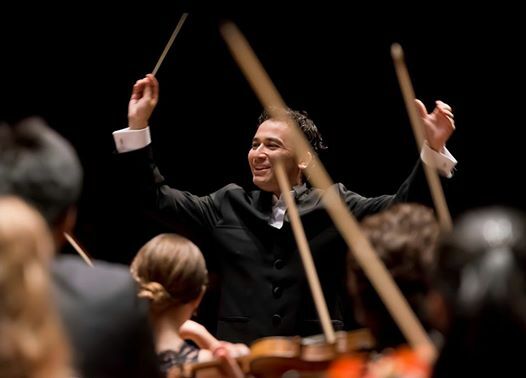 Speaking of our [HSO] great conductor, some fantastic breaking news via Carlos Andres Botero, the music ambassador for the Houston Symphony Orchestra on his Face Book page: "Music Director Andrés Orozco-Estrada has extended his contract with the Houston Symphony into the 2021-22 season!" This will be a great concert program featuring two of my favorite Beethoven symphonies. It also features two of my favorite movements in the symphonic repertoire: the beautiful melodic last movement [Allegretto] in Beethoven's Pastoral symphony #6 and the beautiful and mesmerizing Allegretto movement of Beethoven's symphony #7. Here is how the Houston Symphony Orchestra website characterizes this weekend's symphony concert: "An exploration of nature, Beethoven’s Pastoral Symphony evokes cheerful feelings upon arrival in the countryside and a harrowing storm which resolves in one of music’s most satisfying finales. Beethoven’s lively Seventh Symphony abounds with high spirits that surround a haunting second movement, featured in films such as The King’s Speech." Please turn up the volume and play in full screen to hear some grand symphonic mastery from "the master". Update: What a magnificent concert it was for me and the fetching Mrs. B. 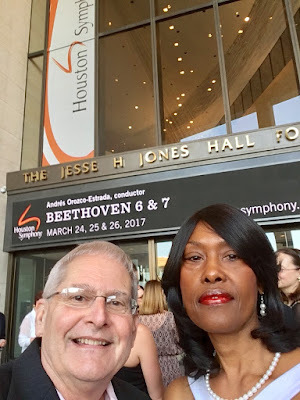 We have never heard the Houston Symphony Orchestra sound any better - under the great baton of Maestro Andres Orozco-Estrada [HSO director] - this was indeed the sound of a world class orchestra in both the Beethoven 6th and 7th symphonies. They had a new set up of the orchestra, putting the double basses in the back where the percussion instruments usually are, and they had the timpani on the right side [from the patrons perspective]. Wow, it really made a difference in the wonderful sound. At the end of the awesome Beethoven 7th, the patrons leaped to their feet in shouts of Bravo, making Maestro Estrada come back for 3 standing ovations-a response you usually only see given to soloists in a virtuosic concerto. This was truly a special concert. Bravo and thank you Houston Symphony Orchestra!